Editor's note: The names marked with * in this story have been changed to protect privacy. SLO County living is a mixed bag. We have pretty amazing year-round weather, but housing is enormously expensive. So what do you do when your house is small, your budget is modest, and you need more living space? Take a look at the range of possibilities below. 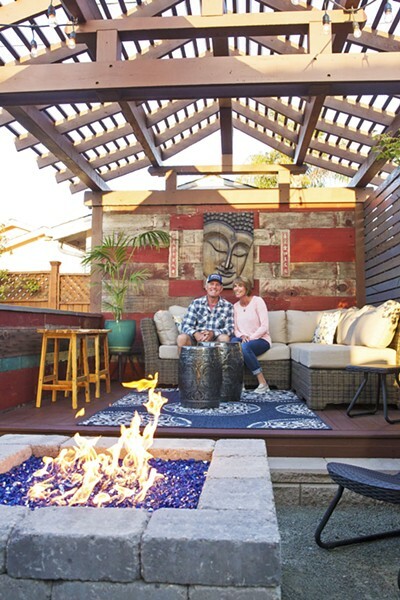 PERFECT GETAWAY Because their Shell Beach home is small, Kevin and Susan Bratcher spread out in all directions, creating an Asian pergola in the backyard that doubles as a stage for house concerts. Building materials aren't cheap, but if you're handy, you can make your budget go further by doing your own labor. Susan and Kevin Bratcher of Shell Beach bought their 1961 Craftsman-style home two years ago, and it was severely dated with a yard that was an overgrown mess. At a mere 1,084 square feet and with two adult children at home in a three-bedroom, one-bath, it was imperative that they maximize their outdoor area. Luckily, Kevin is an electrical contractor and skilled guitar builder, so not only has he been around construction, but he also has excellent fine carpentry skills, so he set about creating an Asian-themed outdoor living area in both the front and rear of their home. French doors open the Bratcher living room to their front yard, which contains an outdoor living room with a couch, two chairs, a coffee table, and a stand-up heater. A cantilevered umbrella is in the plans as well. Out back is a dining area for eight, a gas fire pit, and a raised pergola with lounge seating that doubles as a stage for singer-songwriter Susan Richie, as she's known locally, and her musician friends. There's a bar along the side, too, and outdoor string lights offer a magical ambiance at night. It was all designed by Kevin, who didn't write out plans—he could see it all in his head. They opted for low-maintenance landscaping and an Asian garden theme. Of course, it didn't happen all at once. "We just had to approach it one thing at a time," Susan said, "and be thoughtful about it." "It's a work in progress," Kevin added. "You do one project, save up the money and do the next." Not everything went exactly as planned. Kevin originally wanted to build an arbor-like shade structure over the front yard seating area, but as he built the structure, a neighbor complained to the city of Pismo Beach, and he was forced to scale back his plans. "I was trying to play off the Craftsman-style lines of the house while incorporating the Asian garden theme, trying to mesh both," Kevin said. Kevin's Asian-style pergola utilized reclaimed fence boards from the derelict fence that surrounded the home when they purchased it. For the new fence and the arbor built over their outdoor dining area, the Bratchers opted for specially milled redwood, which he painted so it would withstand the elements even longer. "I wanted to get something that was going to last," Kevin said. WINE LOVERS' DELIGHT Karen and Mark Libby's Shell Beach rental features a temporary arbor festooned with sun sails set in concrete-filled buckets and a custom wine table Mark created under WeevilWorks, the name of his woodworking business. The Bratchers' neighbors, Karen and Mark Libby, also have a wonderfully designed outdoor living area, but they're renting, so much of what they've done isn't permanent. Their ingenuity proves that even if you're renting, it can be worthwhile to maximize your outdoor area. The arbor Mark built has its posts in concrete-filled buckets, so if they ever move, he can disassemble it and take it with. He's rigged it with triangular sunshades you can buy at most hardware stores. 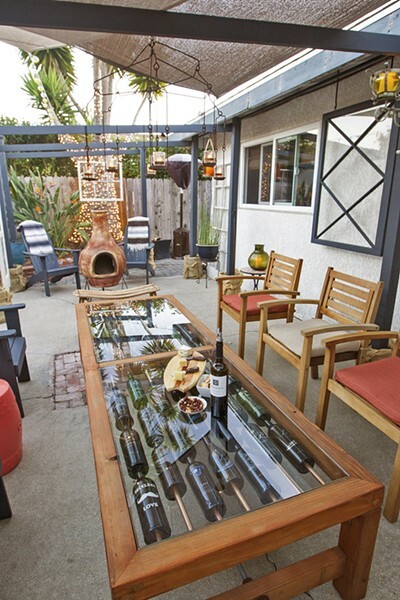 The centerpiece of the Libbys' backyard is a gorgeous wine-themed table built by Mark himself. He recently retired, and to keep himself busy, the woodworker has opened WeevilWorks, which will manufacture similar tables custom designed for the purchaser. One new client is a winemaker who wants a "legacy" table featuring the various wine bottles his label has released. It obviously helps to have building skills! Out in Los Osos, Isaac Horton has created a tropical paradise that looks more like Indonesia than the fog-shrouded back bay. The bamboo propagator and proprietor of Isaac Horton Design has built two greenhouses, one with a hydroponic vertical garden of his own design, where he can grow his own food. He rents, but that hasn't stopped him from making his space his own over the past six years. He's got a very deep lot that was "desolate and covered in weeds," and besides the greenhouses and some raised planter beds, there's also a wood-fired brick pizza oven he built, a dining area, and his outdoor bedroom with a koi pond and waterfall just outside, skylights, and subtle lighting. TROPICAL DELIGHT Designer Isaac Horton's Los Osos rental has been made into a lush bamboo-filled forest with a raised outdoor bedroom next to a koi pond and waterfall, with the building constructed with easy-to-disassemble screws. "I'm kind of an unstoppable force of creativity when it comes to my own spaces," he said. "It's all moveable. I build the whole thing with screws, and it's all within the legal parameters of building codes." 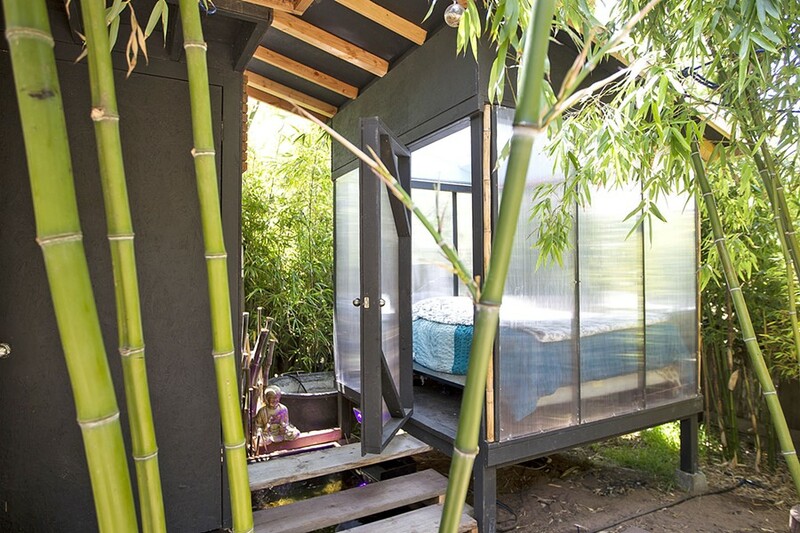 His raised outdoor bedroom has floor-to-ceiling windows, which would have required expensive tempered glass, but instead he used greenhouse plastic. "As soon as I started sleeping out here, I felt better, maybe something about the circadian rhythms, the water sounds, the starlight—it just made me feel better." All the bamboo also helps create the tropical feel. "There was no bamboo back here when I moved it. I imported it from Florida because I wanted the tropical clumping kind, not the runners." One again, an Asian garden theme dominates, and it's incredibly peaceful and beautiful. Sarah and Evan Goldhahn are renters in notoriously expensive SLO Town. They're both musicians—she's a singer better known locally by her maiden name Kleeman, and he's a percussionist who works with PCPA among others—who lived in New York for a decade, but they grew up here and were eager to come home. "I lived in NY for 10 years so there was no outdoor space, but I grew up in this house," Sarah explained. BEAUTY ON A BUDGET Sarah and Evan Goldhahn's SLO Town rental features a 10-by-12-foot deck Evan built with a friend, a store-bought gazebo, and décor by Sarah sourced from Craigslist, consignment stores, and collecting. Her father rented the house when she was young, and now he's the property manager for it. The backyard was already beautifully landscaped, but one corner of the yard was underutilized. 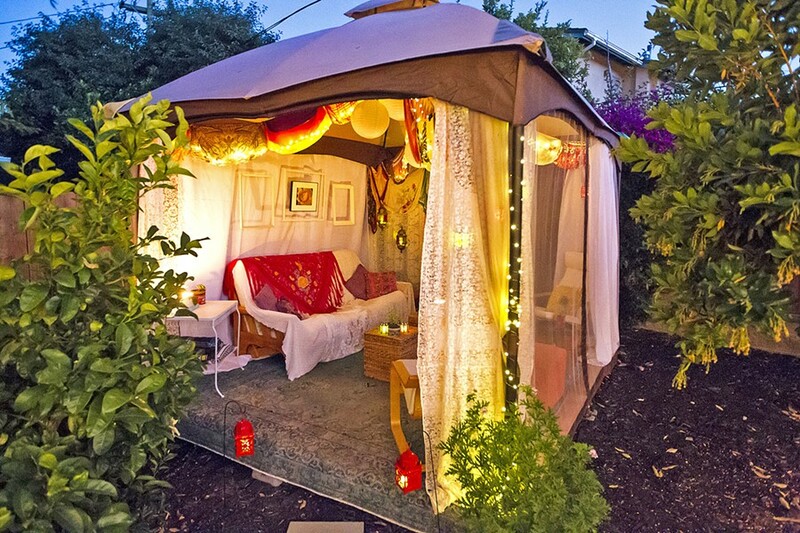 For her birthday, Evan and a friend built a 10-by-12-foot deck on pier blocks, placed a store-bought gazebo kit on it, and Sarah decorated it into an inviting kasbah-like oasis. "I found the chairs at a consignment store, the futon on Craigslist, and I've just been collecting stuff," Sarah said. With tapestries, paper globe lights and cute lamps, and charming knickknacks, it's a peaceful getaway just steps out the back door. And it's fairly inexpensive to create. They also have a seating area and fire pit, a gas grill, and outdoor dining area. And they recently added raised planter beds and have a vegetable garden going. There's no wasted space, but it doesn't feel cramped either. 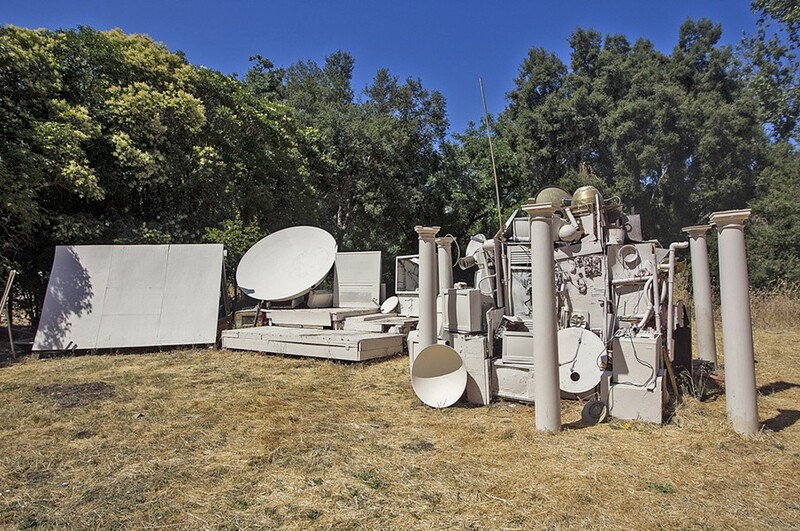 ROAD LESS TRAVELED Twenty-something artist and musician Dr. Isapony XD built what he calls his "time machine"—all sourced from discarded electronics and building materials—in the backyard of his Atascadero rental, where he screens movies and hosts concerts. Dr. Isapony XD*, the stage name for a member of the band The Monroe, has created an outdoor space he calls his "Time Machine"—an unusual structure including a stage, a large screen for projecting films, and a whole mess of reclaimed electronics—everything from TVs to satellite dishes. "We just recently painted it all white," explained the 20-something eccentric and highly creative Dr. Isapony. "It's been here for eight years now, and I just got a lead on a 20-foot satellite dish, though I'm not sure how to get it here." The space has played host to a wide variety of arts events, and Dr. Isapony's rental house also contains The Monroe's practice space and recording studio. "Surprisingly, a lot of people have come through here and experienced the time machine," he said. It's definitely a trippy space, and it has its own Facebook page under the name Stage Pink. Where did the idea come from? "It was like a random dream, and I had a lot of this material that I was going to throw away for a friend, and—boom!—I saw the time machine. I had time traveled in my mind," Dr. Isapony claimed, adding that he's part of the "Time Transit Authority." "I'm just a member of the TTA trying to do experiments," he said. Finny and Stacy Smith own Lavendersmiths and have a 40-acre ranch near Avila Beach where they grow lavender. Purchased in 1998, the once derelict ranch has been completely transformed over the years, in part because of an unforeseen accident. In 2006, a burning fire in the fireplace ignited some newly purchased bamboo mats, which burned the house to the ground. The only part that survived was a carport where the Smiths park their work van, which they use to drive their lavender products—scrubs, soaps, sprays, and more—to area farmers markets. 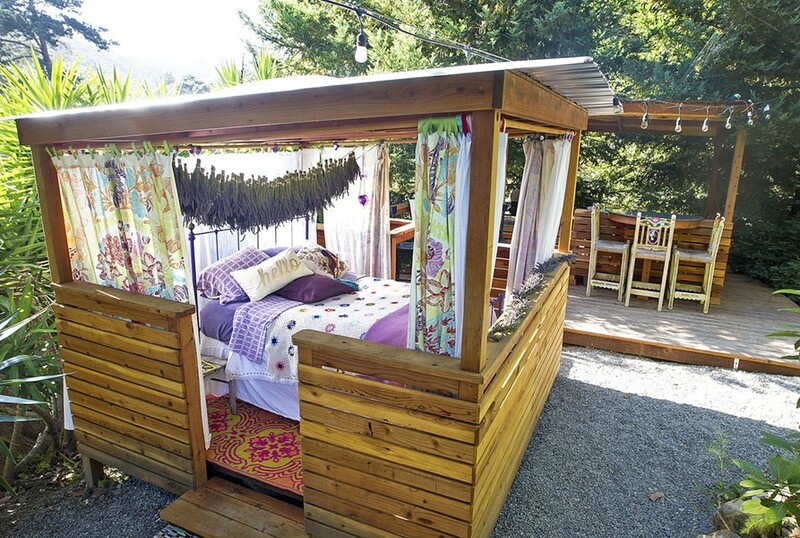 COUNTRY LIVING Finny and Stacy Smith's 40-acre lavender farm near Avila Beach features a variety of outdoor living areas including this outdoor bedroom decorated with drying lavender as well as the outdoor kitchen behind it. "Instead of rebuilding, I decided to take the insurance money and build a kind of living station, sort of a dock for mobile units," Finny explained. "Where the house was is now an ag pond." After the fire, the Smiths bought a small but efficiently designed Airstream trailer, which they lived in as they created their outdoor space—an outdoor kitchen, a bedroom with ceiling skylights to look at the stars, an outdoor tub and shower tucked behind a living bamboo screen, and a Jacuzzi nestled near some bushes. There's also a floating deck with a table, chairs, and umbrella on the ag pond to cut down on evaporation, and their Airstream is now a guest room, as the Smiths have converted a full-sized shipping container into an amazing living space. There's a second outdoor bedroom now, too, and the Smiths are building a granny unit—like the shipping unit on wheels, which makes it legal—that Finny's mom, Mary Jane, will be moving into. When your yard is covered in lavender, you want to be outside as much as possible anyway. 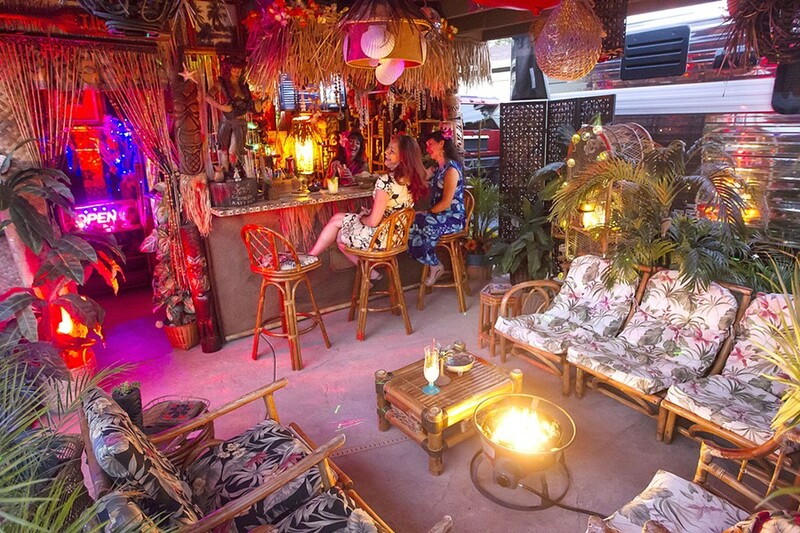 Lil' Tiki Lagoon is the brainchild of Kim Tiki* who enlisted her husband, Kon Tiki*—yes, they're really into the tiki lifestyle!—to build the bar and seating areas of their backyard, the centerpiece of which is a saltwater pool. Yes, the pool cost a bundle and was professionally installed, but everything else is all Kim, who Kon likes to joke can see the value in trash. "Our son and I have gotten used to stopping and digging stuff out of people's trash for her," Kon said. ISLAND TIKI PARTY Kim Tiki (behind the bar) enjoys a laugh with friends at her outdoor tiki bar, a tropical paradise decorated with swap-meet finds and repurposed items saved from the landfill. The Tikis are real Do-It-Yourselfers, having flipped something like 25 houses, built and sold 10 hotrods, and refurbished several vintage trailers, as well as some Volkswagen buses. In fact, Kim has completely tiki-fied a 1964 VW bus that she's brought to several tiki shows. She recently had to tear some of it apart and start over because bamboo has a propensity to pick up a mold spore that turns the bamboo to powder. Kim is undaunted! "Everything's either from the trash or thrift stores," Kim explained, gesturing to her highly decorated backyard and tiki bar. "That's all I do." There are a few naughty secrets too. She slides the cloth sarong around the waist of a Hawaiian-looking carved wooden sculpture of a young man to reveal anatomically correct genitalia. Their fascination with the tiki culture began several years ago during a trip to Las Vegas to attend the Viva Las Vegas car culture and rockabilly festival, where they visited Frankie's Tiki Room, a tiny but perpetually packed bar filled with South Seas exotica and primitivism. "We started going to all the tiki bars in California from Los Angeles to San Francisco, and suddenly the scene just blew up," Kim said. "People were opening tiki bars all over." Kim mentioned, for instance, Solvang's High Roller Tiki Lounge, a wine bar, as a nearby example. "It's definitely become a fad, but we were living it, and we decided to make our own tiki bar at home for our friends to enjoy," Kim said. They even made a beach in the front yard, hauling in 5 tons of sand. Their 1941 SLO Town home is just 840 square feet, so again, it was important to spread their living area to outdoors. "It's too tiny and too hot inside, so we prefer to hang out here," Kim said, gesturing to her covered tiki bar, which she calls her "She Shed," the opposite of a Man Cave. Contact New Times Senior Staff Writer Glen Starkey at gstarkey@newtimesslo.com.